This comment, sitting alone without context, could be interpreted as a cranky indictment of GSA’s leasing capability. It was wasn’t intended as that, though the statement is mostly correct. It will take time for GSA to work through the massive pile-up of near-term lease expirations; therefore, the government will not be able to take full advantage of current market conditions. Let’s take a look at the facts. 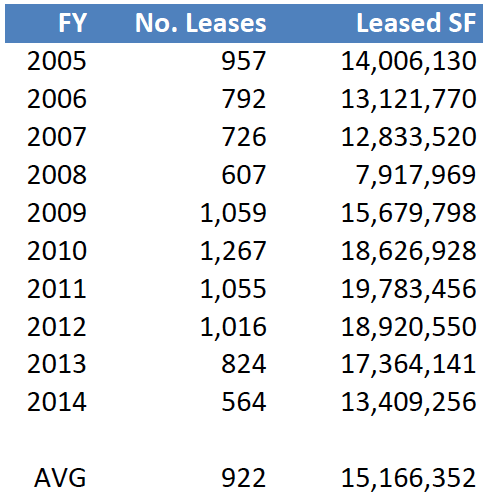 The table below shows the volume of new leases GSA has “completed” in each of the past ten fiscal years (see the note at end of this article to understand how lease commencements are used as a proxy for completed leases). Looking back at this ten year stretch, GSA has completed an average of 15.2 MSF of new or replacing (i.e. “renewal”) leases annually. In the best of these years (2011), GSA completed 19.8 MSF of new/replacing leases. The total volume scheduled to expire in FY 2015 is 29.4 MSF. That’s 87% more than the GSA’s average leasing volume and 48% more leasing than GSA accomplished in its best year. Maybe I’m guilty of a little hyperbole as quoted by the Washington Business Journal; yet, the gist of my statement holds true. So, what happens to the leases that GSA does not negotiate anew? As evidenced from GSA’s own data, most leases simply extend at the end of their terms (and unfortunately sometimes that method of extension is holdover). The primary reason for the high volume of extensions is overwhelming workload paired with budgetary and planning challenges associated with edicts to freeze and ultimately reduce the footprint, actions that typically require significant rethinking of the workplace. Of course, we should not expect the complete eradication of lease extensions. When used strategically, extensions have a useful purpose, allowing for future consolidation or realignment of facilities. Yet, as a practical matter, the government mostly relies on extensions as a form of triage. The great irony is that extensions provide only a modest shortcut through the procurement process. Even short-term extensions are presented with a bureaucratic obstacle course that takes time, sustained effort and limitless patience. Can GSA ever catch up to its workload? The answer is yes, but it will take a while. If you do the simple math assuming you want to achieve “normal” leasing flow where, say, 90% of leases are new/replacing and only about 10% are extensions (a fantasy that exists only in the slumberland musings of the nation’s largest federal property investors) and the remaining leases roll forward in a bow wave to future years, then it would easily take about five years for GSA get its workload fully under control. To put that in political terms, it will take the remainder of this presidential administration and the entire the elected term of the next one. A lot can happen in the interim. We use the word “completed” to generically describe leasing volume based upon lease commencements. We don’t actually know when all of these leases were originally executed, which would have been our preferred standard. Unfortunately, it’s impossible to estimate lease execution dates based upon lease commencement because sometimes the government will execute leases years in advance in the case of build-to-suit projects or after commencement in the case of holdovers. Given the limits of GSA’s publicly available data, “completed” (i.e. commenced) leases will have to suffice. Some would argue that any analysis of GSA leasing capacity should focus on the number of leases GSA completes instead of their square footage (looking at the number of leases completed instead of square footage yields a slightly more hopeful outlook, by the way). There’s pretty solid logic to that since small deals are subject to the same cumbersome procurement process as larger ones, despite GSA’s efforts to implement streamlined procedures. However, the largest leases must endure congressional prospectus approval and a towering hierarchy of scrutiny. It doesn’t take many of these to really gum up the works, so we look at square footage as the preferred measure.